Tonight’s UFC 146 post-fight press conference takes place at the MGM Grand Garden Arena and will stream LIVE on ProMMAnow.com (www.prommanow.com). UFC heavyweight champion Junior Dos Santos successfully defended his title against Frank Mir in the main event and former champion Cain Velasquez defeated Antonio “Bigfoot” Silva in the co-main event. Dos Santos and Velasquez, as well as other UFC 146 main card winners will take part in the press conference and answer questions from the media. 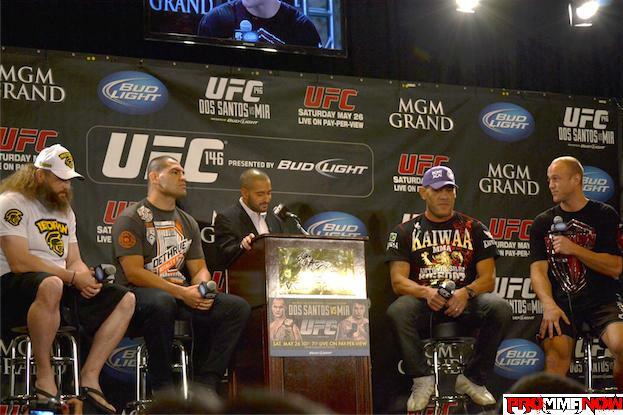 If you miss the live stream, no need to worry, an on-demand video replay of the UFC 146 post-fight presser will be made available shortly afterward.